I am fortunate to have been the recipient of four recent releases from the Belgian independent label Classic Talent. The label continues to explore lesser-known Classical and Romantic repertoire and the vast majority of their issues I have found fascinating and rewarding. This release is an attractive collection featuring a work each from seven late-Romantic composers. The major work here is undoubtedly the Saint-Saëns. 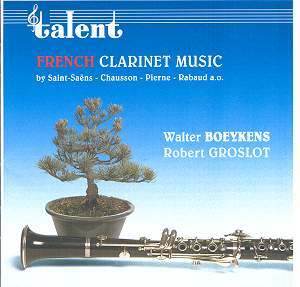 In 1921, the last year of his life, Saint-Saëns set out to compose sonatas for each of the main woodwind instruments. He never composed those sonatas for cor anglais and flute but he did write three sonatas, one each for oboe; bassoon and clarinet. The Saint-Saëns sonata is a work worthy of considerable attention and is one of his lesser-known gems. I remain delighted by my review copy of an impeccable version of a work that is played with such vigour and charm by clarinettist Richard Hosford and pianist Ian Brown. The 2004 account recorded at the Henry Wood Hall, London is available on a well-filled double set of Saint-Saëns�s Chamber Music performed by members of the Nash Ensemble on Hyperion CDA67431-2. The Fantaisie was composed in 1911 by Philippe Gaubert who was a distinguished flutist and conductor. Gaubert served as a professor of flute at the Paris Conservatoire; principal conductor of the Société des Concerts and chief conductor and artistic director at the Paris Opéra. The Fantaisie is a graceful and highly expressive score. Ernest Chausson was a young man when he composed his Andante et Allegro. Attending the Paris Conservatory as a pupil of Massenet, Chausson entered this work for that prestigious competition the Prix de Rome but was unsuccessful. I admire the award-winning performance of the Chausson from pianist Pascal Devoyon and clarinettist Charles Neidich. Their stylish and sympathetic reading forms part of a disc of Chausson Chamber Music recorded in 1997 at St-Nazaire on Hyperion CDA67028. Gabriel Pierné is primarily remembered as an organist at the Sainte Clotilde cathedral, in Paris. A pupil of Franck and Massenet he won the esteemed Prix de Rome in 1882 for his cantata Edith. Pierné also conducted the celebrated Concerts Colonne and I believe he composed for Diaghilev's Ballets Russes. The Canzonetta was composed in 1888. My preferred version is from clarinettist Gervase de Peyer and pianist Gwenneth Pryor recorded at Rosslyn Hill Chapel, Hampstead, London in 1982-83 on a disc of French Music for Clarinet and Piano on Chandos CHAN 8526. Henri Rabaud was a student of Massenet at the Paris Conservatoire and won the Prix de Rome in 1894 with his cantata: Daphné. In 1920 Rabaud succeeded Fauré as director of the Paris Conservatoire. A conservative composer Rabaud was known for using the catch phrase, "modernism is the enemy". The Solo de Concours was composed in 1901 as a test-piece for the Paris Conservatory. André Messager worked as a conductor at the Folies-Bergère in Paris, the Eden-Théâtre in Brussels and in London for Richard D'Oyly Carte's Opera Company. Messager was a great friend of Gabriel Fauré who as director persuaded him to write the Solo de Concours as a clarinet test-piece in 1899 to be used at the Paris Conservatoire. The leader of musical impressionism Debussy was one of the most important and influential composers of the twentieth century. He studied at the Paris Conservatoire and in 1884 won a coveted Prix de Rome with his cantata L'enfant prodigue. Originally composed as a chamber score for clarinet and piano for the Paris Conservatoire, the Première Rhapsodie was written in 1909-10 and orchestrated in 1911. It inhabits the same sound-world as his famous score Prélude à l'après-midi d'un faune. Although the work was named by Debussy as his Première Rhapsodie he never wrote a second. My preferred version is again from de Peyer and Pryor, featured on the same disc as the Pierné preference CHAN Chandos 8526. Although not currently in my collection, I have heard approving reports of an account by clarinettist Ralph Manno and pianist Alfredo Perl on Arte Nova. This Classic Talent collection is played with style and authority, displaying phenomenal virtuosity and impressive insight. I especially enjoyed the reading of the Saint-Saëns where the exquisite playing of the opening movement makes the hairs stand up on the back of the neck. A touch more jauntiness would have improved the vigorous allegro animato. In the Gaubert the duo communicate an overriding sense of sadness and in Chausson�s Andante et Allegro I was impressed with the serious character imparted to the andante and the robust and restless quality of the dark and unhappy allegro. Boeykens and Groslot perform Pierné�s brief and attractive Canzonetta (which lasts 03:36 and not 07:20 as stated) with remarkable control and impressive weight of tone. With Rabaud�s test-piece I was moved by their ability to communicate the overriding shadowy and sombre character of the score. The Messager�s has swiftly varying moods to which the partnership adjusts seamlessly with alertness and fluency. The concluding work, the Debussy, comes from his radical Impressionism and is clearly different in musical style to the six late-Romantic scores that it follows. The duo provide an unaffected and natural interpretation of this very beautiful and atmospheric piece. It seems to be characteristic of Classic Talent to provide uninteresting and error-strewn booklet notes that are lacking in what one would generally consider to be essential information. Details of the recording dates and venues are not supplied either which contributes to the disappointment of the pretty dismal presentation. The sound quality on the other hand is of a decent standard. These are first-rate performances even if they would not necessarily be my first choice. A disc certainly worth hearing.